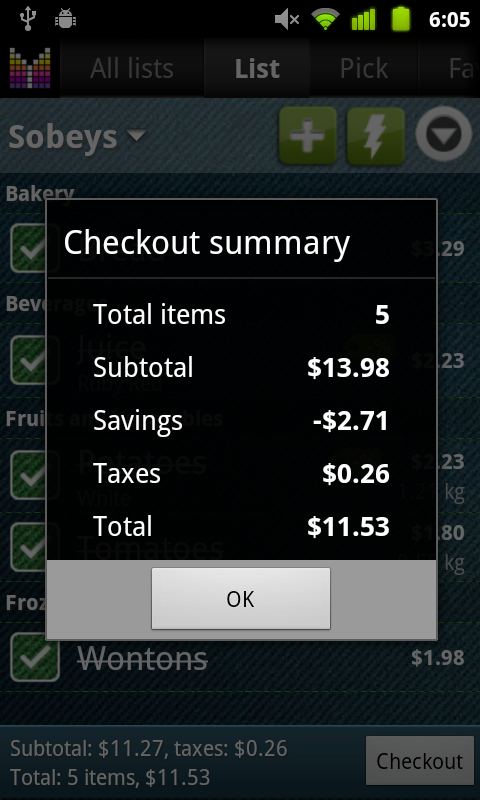 Best Grocery Shopping app This is one of the best apps I have found in Google Play. Mighty Grocery has a great website and support, something most apps don’t include.This app is fully customizable and pro version works great for sharing shopping lists with my wife. In Vancouver BC we shop at numerous grocery stores during the day with a shared list and this app keeps track of what has been purchased and where. It constantly updates our list with purchases or with new additions. If you want, you can also keep track of the prices you are paying for each product at each store. This app can work for any type of store or products. I have tried other shopping apps and nothing comes close to the involvement this app can give you. I would like to take a discount off of whole list amount, not just individual items. What is that way to do this? Ron, thanks for your question. Unfortunately, discount is only possible for individual items. But we have plans for adding discounts off the whole purchase going forward. Can we still log into the beta of the web interface? I’m trying with the twitter invite and can’t get in. Thanks! Hi Maria, thanks for your question. Yes, the invitation code should work. Please make sure you are entering TW347 using uppercase letters. Cheers! Is there a way that when I checkout and a coupon was used that it will automatically take the coupon off the product in the pick list? Hi Michele, thanks for your question. Unfortunately there is no way to do that in Mighty Grocery, but it’s a nice improvement which may be considered among other enhancements to coupon feature. Sounds great..also I usually keep 2 like coupons, can you condiser adding a feature that would allow you to list the number of coupons for a product. Michele, thanks for the suggestion. Will consider it too. Another question.. Can I change the preset Aisle Names..ex.Electronics to Personal Care. Yes, it is possible to change aisles using Manage aisles feature. However I’d recommend adding new aisle so that existing products from Electronics won’t end up under Personal Care. How do I remove items from a store shopping list? I can press the arrow to the right of an item, which brings up the Edit Item box, and delete it from there using the menu, but this removes the item entirely from the pick list. If there isn’t a simple method to do this, how about adding something like a long-tap “remove from list” option for the green square to the left of the item, that would only remove the item from the store shopping list but still keep it in the pick list. Hi there, thanks for your question. I’d recommend using Menu –> Settings –> Pick list –> My picks to populate your Pick list. Also, item will remain on Pick list if it has been Checked out at least once. Could you make the Aisles list so that you can re-order them? That way I can set them in the same order as the aisles in my store, even though it’s probably different than the next store…. Nevermind….I just found how to do that! Adam, thanks for your feedback! Just in case someone else will have the same question, here is the link to Manage aisles User’s Guide. I would like to trend my grocery list so that I will know when to expect rock bottom prices. How can I export the history into excel? Thanks. Kathy, thanks for your question. Unfortunately, it’s not possible to export history yet, but we may consider this feature later this year. 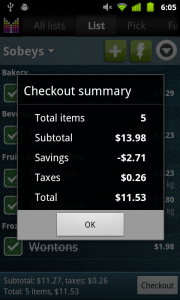 Make the checkout summary so you can turn it off! Hi Richard, thanks for your feedback. Adding your suggestion to plans for Beta 20. Thanks.